A mayor has thanked an editor working in the city he serves – despite initially receiving “dark warnings” ahead of his appointment. City of Ely Council mayor Mike Rouse has paid tribute to Ely Standard editor John Elworthy, describing him as a “real journalist dedicated to sniffing out a story and exposing political shenanigans”. 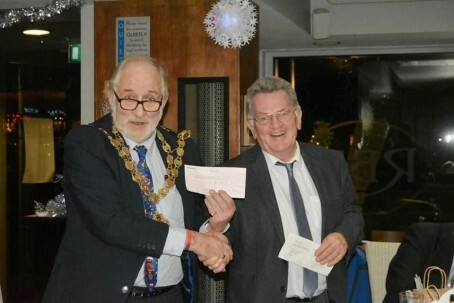 Councillor Rouse was speaking at the authority’s annual dinner, where John was handing over a cheque for £645, the proceeds of a raffle held during the Standard’s annual business awards at Ely Cathedral. He told the dinner that when John became editor of the Ely Standard six-and-a-half years ago his reputation “as far as I was concerned came before him”. Cllr Rouse said: “I was a member of the county council when he took over as Editor of the Ely Standard and I received what can only be described as rather dark warnings from my Fenland colleagues about this man Elworthy. “And then I met him. A real journalist dedicated to sniffing out a story and exposing political shenanigans but also committed to his newspapers to reflecting and telling the story of the community, his readership. Cllr Rouse went on to thank John, who also edits the Cambs Times and Wisbech Standard, for his attendance at the event. Commented John: “I’m very proud of what we as a newspaper do to promote Ely – and I was pleasantly taken aback when Mayor Rouse delivered his few kind words. “With the Ely Standard we are lucky to have a solid base of community news and engagement built up by my predecessors and we’ve developed it from there. “We help deliver numerous community events, work with organisations to encourage and help them submit their articles and photos, and ensure we deliver some first class exclusives as the icing on the cake.